In our world, this is an epic tale of man and machine. Ask anyone who works at Peiffer (or has worked at Peiffer) and they’ll know about this machine: the Droop & Rein. It’s as much a part of Peiffer’s history of work as it is a vital force in production on our customer’s shop floor. The Droop & Rein is an FS160 model, heavy-duty vertical mill, with a swivel head (3-axis) and a quill hand feed. Our customer, a large steel mill and forging company, purchased the machine in 1983, as their company installed one of the largest rotary forges in the United States. The machine’s main job: to machine the surfaces of forge hammers. At the time, the “Droop” was estimated to be 18 years old and needed a lot of mechanical repair, as well as replacement of the electrical controls. Peiffer quoted the extensive re-work and was awarded the contract. 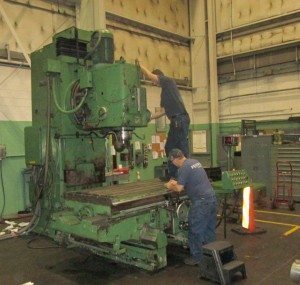 The machine was brought to Peiffer for disassembly and repair, which included: way repair, mechanical repair, replacing electrical clutches and brakes, adding digital readouts, building a new control panel using a PLC, and installing all new electrical hardware and a new operator’s station. Upon completion, a run-off was performed at Peiffer, and the newly refurbished Droop & Rein “passed inspection” for operation. Our customer had the machine installed at their facility and placed the control panel in an air-conditioned clean room. The machine itself was located adjacent to several large furnaces, a welding repair area, and a forge press–all manufacturing operations that generate a lot of “dirt”. We also learned the machine would be cutting some of the toughest material known. The “Droop” was a real workhorse. To our satisfaction, as well as the customer’s, the machine performed very well. The customer asked us to perform Preventive Maintenance on the Droop & Rein, which they scheduled during their plant shutdown period—typically in July (you can imagine the working conditions, alongside a large furnace in the middle of the summer). Together we learned that the environment the machine operated in was causing some serious wear issues; to lessen the environmental toll on the machine, Peiffer made several custom covers to help protect the machine. We also developed a list of “wearable” parts (e.g. nuts, screws, bearings, PIV drive boxes, clutches, wipers, etc. ), and the customer took the initiative to stock these critical components. On Peiffer’s end, several employees started keeping their own logs of the work accomplished on the “Droop”, so we could be well prepared for each annual PM. As demand for our customer’s work grew, they installed more forges. Run time for the Droop & Rein increased to 24 hours a day, 7 days a week to keep up with the necessary hammer repair. Given our history with the machine, as well as our reliable service, Peiffer became the “go to” maintenance and repair partner. When the “Droop” went “down”, Peiffer was called and responded (usually same day) to get it back up and running, at times working late into the night to restore operation as quickly as possible. From 1983 through 2012, Peiffer kept this vital workhorse running. Through that time period, we responded to an estimated 21 service calls for repair and performed 29 PM service programs. Several years ago, we heard from our customer that they were considering replacing the Droop & Rein. Perhaps it had just run its course. They purchased another mill (different brand/model), but soon discovered the new machine was not an equal replacement for the “Droop”—the new machine could not come close to the speed or “toughness” of the old Droop & Rein. Subsequently, Peiffer was asked to quote another partial rebuild of the Droop & Rein, in hopes that it could be restored to at least some of its former efficiency and accuracy. The plan was to move the “Droop” to the Peiffer shop, once again, as the customer planned to then relocate the machine to another location in their facility where it would “stay clean”. One caveat for the project this time around: the work window was just two weeks. The company allocated funds for the mechanical repair, while the electrical portion was put on hold. Parts lists were generated, and as soon as the parts arrived, the “Droop” returned to Peiffer for disassembly and repair. For ten straight days, the Peiffer team worked two shifts, 12 hours each. The “Droop” was disassembled down to the bed. The bed was machined, and new way liners were installed under the saddle. The top of the saddle was machined, and new liners were installed under the table. The screw and nuts (including support bearings) were replaced, and lubrication meters, as well as wipers, were also replaced. The machine was reassembled and fully inspected by the customer. The “Droop” was loaded on the truck on the tenth day for its journey back to its new home at the customer’s plant. The Peiffer team followed for re-assembly in the new machine location, as well as leveling and run-off to ensure “good working order” as the “Droop” was returned to production. Later that same year, we accomplished some of the “on hold” electrical repair and also performed a shortened PM. Several months ago, late in 2014, we received the kind of call that makes us cringe: the mighty “Droop” had crashed. We literally dropped everything we were doing and responded. How could we not? This was THE Droop & Rein. Arriving on site, we found pieces of the casting broken, shafts bent, the spindle damaged—the “carnage” was extensive. This was bad—REALLY bad. As our customer assessed the situation, we dismantled the critical assemblies and brought them back to the Peiffer shop for in-depth examination. Our first thought was: this may be the “end of the road” for the “Droop”—we may not be able to fix it. Our customer began looking for another used machine, but as before, could not find one. In the meantime, the Peiffer team toiled over the “Droop” wreckage—we just could not let it go. As we pried apart the smashed assemblies and catalogued the damaged areas, we began to say: “What if…. ?” The Peiffer team’s ingenuity and dedication are a force, too. Together we came up with a plan to repair one of the critical castings, a temporary fix, that could restore the “Droop” to some semblance of operation while a new casting was being made. Long story short: we performed a miracle for the Droop & Rein. The repaired assemblies and replacement components were re-assembled on-site at the customer’s plant, and the “Droop” is once again back at work, running good parts. We look forward to keeping this highly valued machine running for our customer for many more years to come. We know, as they do, that some machines are truly irreplaceable. Editor’s note: Many thanks to Peiffer Sales Engineer, Dale Harring, for his expert recollection and memorable story-telling which inspired this post.